What is the best brisket value in Texas? Previously, I asked which Texas BBQ joint overall is the best value. After a Twitter exchange yesterday about brisket value, I wonder which Texas BBQ joint's brisket offers the best value. So, which joint is your pick? 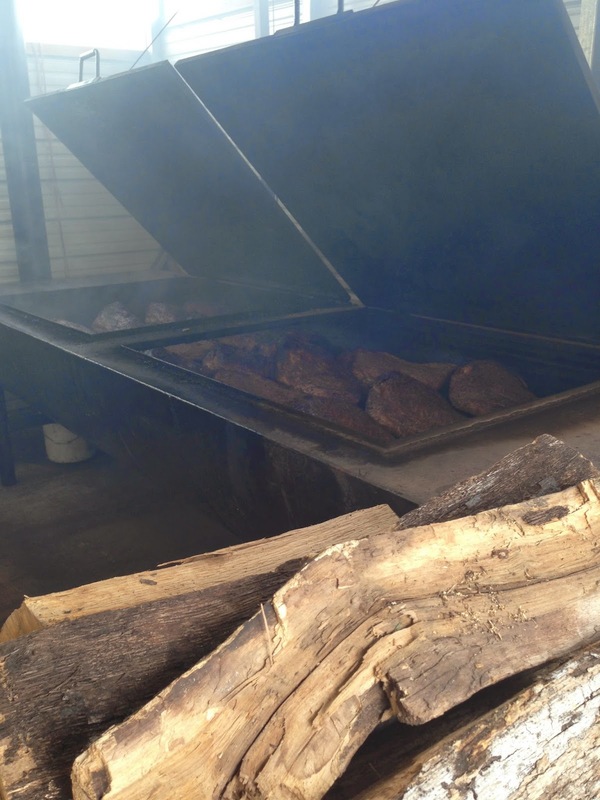 Which Texas BBQ joint serves the best-value brisket? Happy Thanksgiving, Texas BBQ folks! 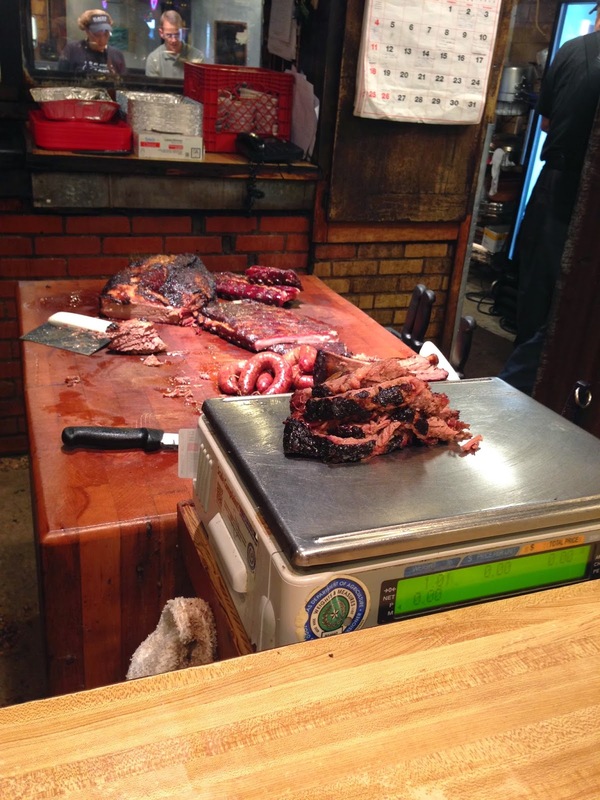 To all proprietors of Texas BBQ: Happy Thanksgiving! Thank you, pitmasters, cooks, managers, waitstaffs. Thank you, for planning, prepping, smoking, cooking, cutting, serving, & cleaning up after the rest of us. We appreciate all you do to give the rest of us something to eat, take pictures of, and talk about. We hope you have a great Thanksgiving day. Hopefully, you're off today, enjoying yourself, your family, & your friends. To everyone: If you send me pictures of what you're smoking in the backyard today (Meat, people! ), I'll add them to my Backyard BBQ collection. Happy Thanksgiving! This week's college Gameday Giveaway matchup is TCU at Texas (tomorrow, 6:30 PM Central). To be counted, your prediction must include winner, final score, & total yards (total yards is in case of a tie). Any prediction submitted after kickoff will not be accepted. 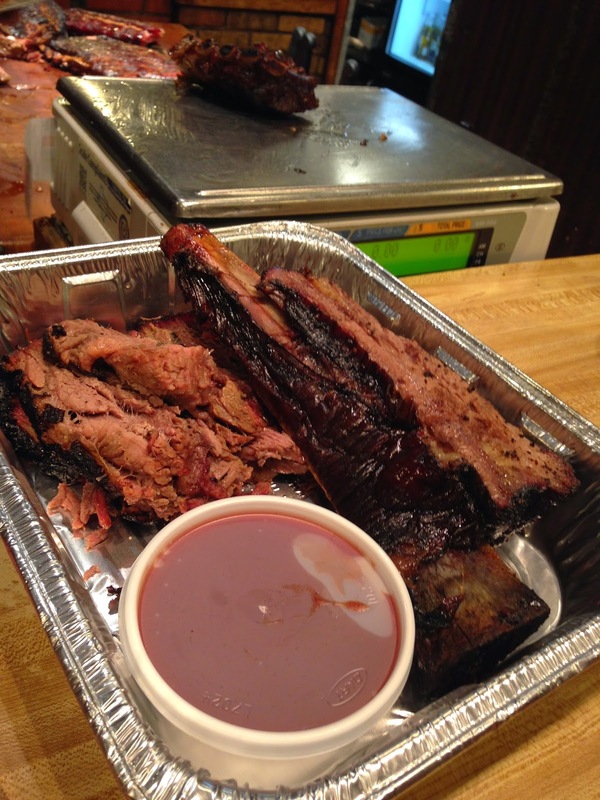 This week's prize is a $25 gift card from Mann's Smokehouse! You can enter your prediction via comment below this post, via email, or you can tweet it to @ManUpTexasBBQ or submit via Facebook. 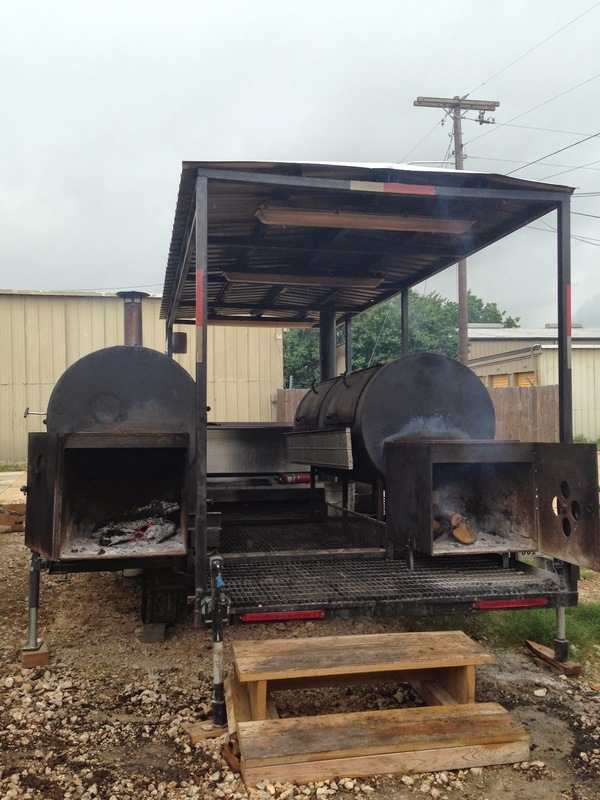 Which Texas BBQ joint smokes turkey best? Two days until Thanksgiving Day! I'm a huge smoked-turkey fan. Don't like roasted turkey at all, but I loved the smoked variety found at many Texas BBQ joints. If you could have one Texas BBQ joint provide the turkey for your Thanksgiving Day spread, which joint would you choose? 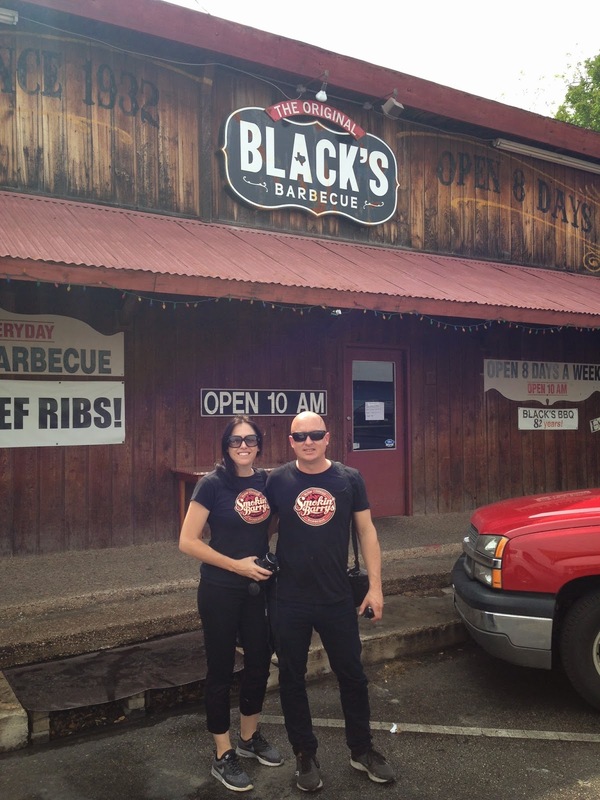 The 3rd stop on the Aussies' grazing tour of Central Texas BBQ was Black's Barbecue (Lockhart, TX). 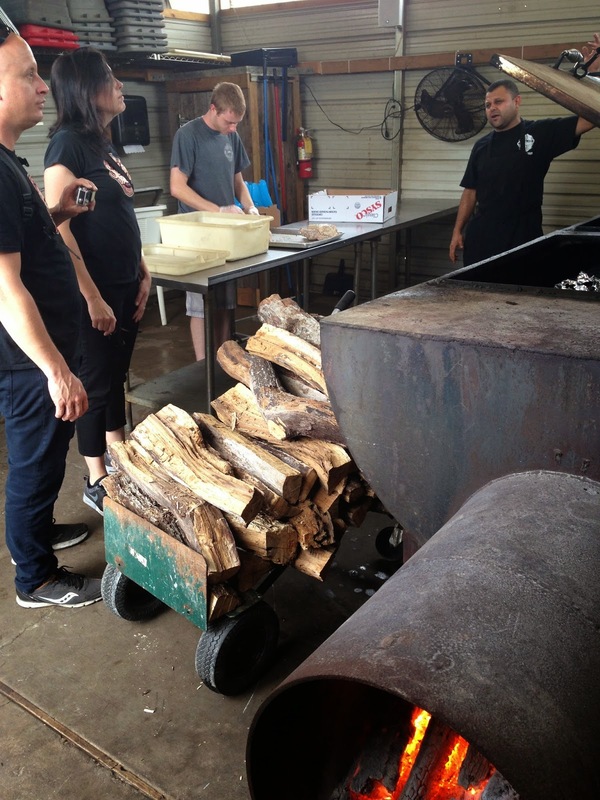 They toured the kitchen and pit and spent time with pitmaster Kent Black. But first, brisket, sausage, pork ribs, and several sides. I was impressed they were able to continue eating their 3rd meal in such a short amount of time. They came to play! 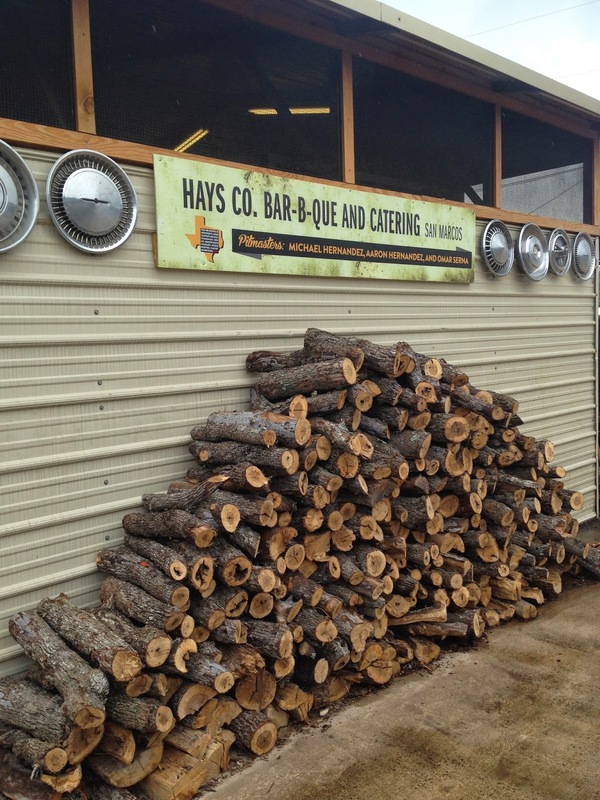 QOTD: Biggest rise-or-fall BBQ joint? If you're like I am, there are some Texas BBQ joints you like much more or much less now than when you first ate there. Sometimes, our initial impressions don't turn out to be staying ones. 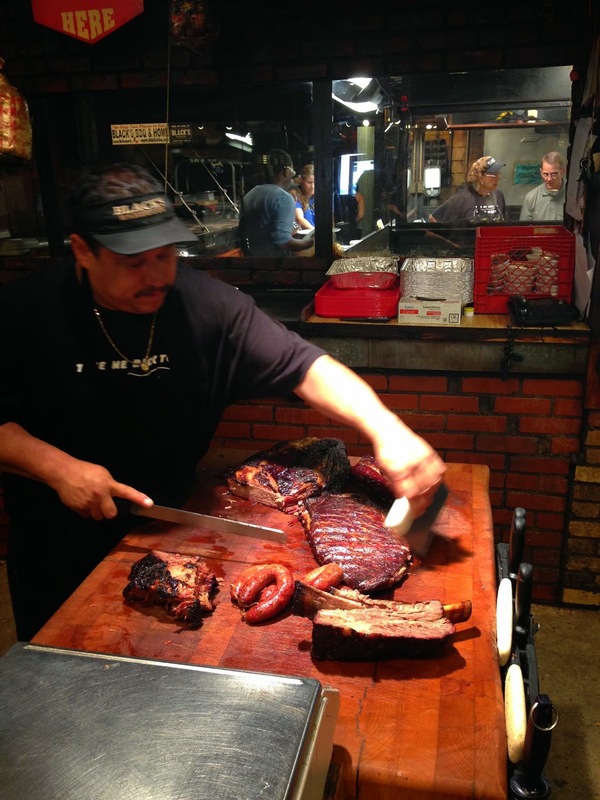 So, which Texas BBQ joint is the one with the biggest rise or fall in your valuation since your first visit? 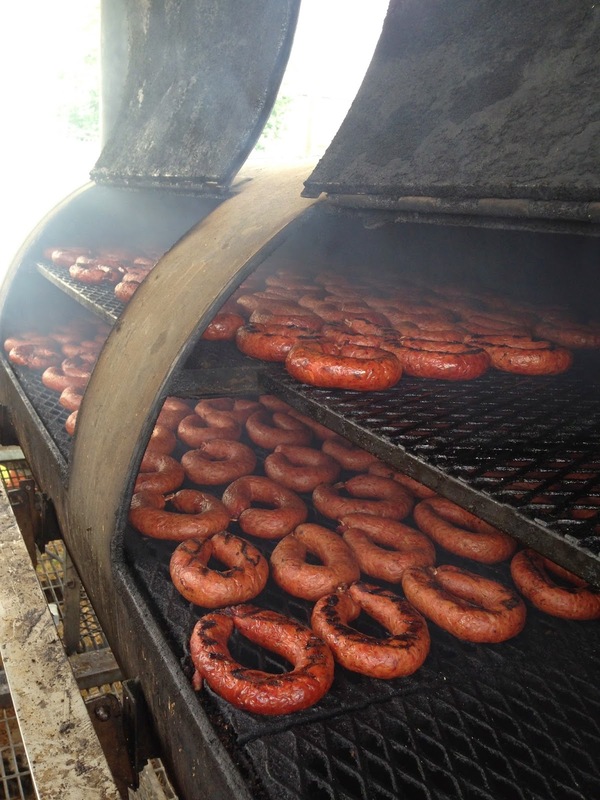 As always, when the Cowboys play, 2 links of sausage from Lockhart Smokehouse are up for grabs! This week's giveaway matchup is Dallas at New York [Giants] (tomorrow, 7:30 PM Central). To enter the giveaway, submit your prediction (winner, score, total yards) via blog comment, Facebook, Twitter, or email. You have until kickoff to submit your entry, so don't wait! As always, when the Texans play, a whole slab of pork ribs from Pizzitola's BBQ is up for grabs! This week's giveaway matchup is Cincinnati at Houston (tomorrow, noon Central). To enter the giveaway, submit your prediction (winner, score, total yards) via blog comment, Facebook, Twitter, or email. You have until kickoff to submit your entry, so don't wait! This weekend's college Gameday Giveaway matchup is Oklahoma State at Baylor (tomorrow, 6:30 PM Central). To be counted, your prediction must include winner, final score, & total yards (total yards is in case of a tie). Any prediction submitted after kickoff will not be accepted. This week's prize is a Pitmaster Combo (4 bottles of sauce & 1 bottle of rub), courtesy of the new Austin location of Black's Barbecue! You can enter your prediction via comment below this post, via email, or you can tweet it to @ManUpTexasBBQ or submit via Facebook. The rest of the pics from the Hays County Bar-B-Q (San Marcos, TX) stop of my tour with Smokin' Barry's. These pics are out back of the restaurant. In addition to the smokers, lots of seating (including covered seating), a stage for live music, washers, a playground for the kids, and a bar for the non-kids. After an outside-chopped pork sandwich Friday night at Full Moon BBQ (Jasper, AL), I had another Sunday night, before flying back to Texas Monday. Saturday, before the Alabama-Mississippi State game, I hung out with friends at a gameday house in Tuscaloosa. Among other food, the hosts had ribs, chicken, & sausage from Dreamland BBQ. Friday night, for first dinner, I had an outside-chopped pork sandwich at Full Moon BBQ (Jasper, AL). Served with sauce, pickles, & chow chow. 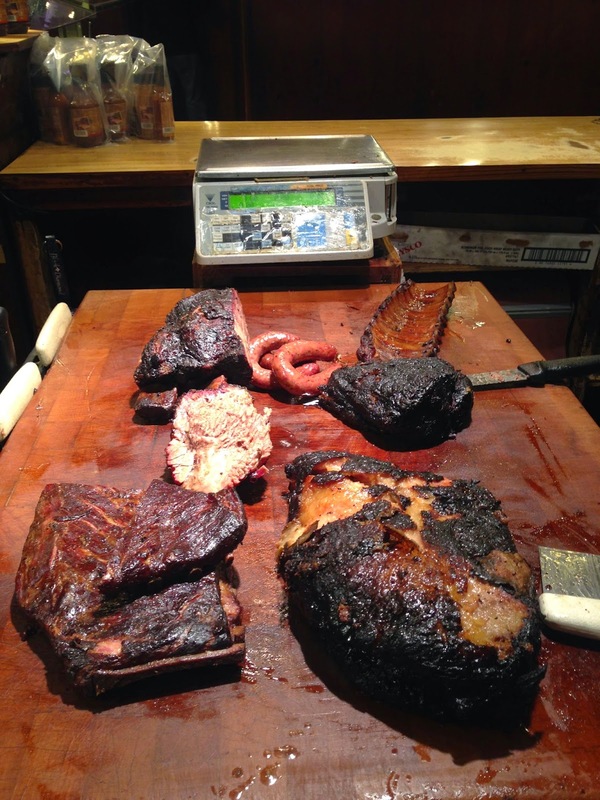 As always, when the Texans play, a whole slab of pork ribs from Pizzitola's BBQ is up for grabs! This week's giveaway matchup is Houston at Cleveland (tomorrow, noon Central). To enter the giveaway, submit your prediction (winner, score, total yards) via blog comment, Facebook, Twitter, or email. You have until kickoff to submit your entry, so don't wait! This weekend's college Gameday Giveaway matchup is Texas at Oklahoma State (tomorrow, 6:30 PM Central). To be counted, your prediction must include winner, final score, & total yards (total yards is in case of a tie). Any prediction submitted after kickoff will not be accepted. The closest prediction wins a Trough from Pecan Lodge (Dallas, TX)! 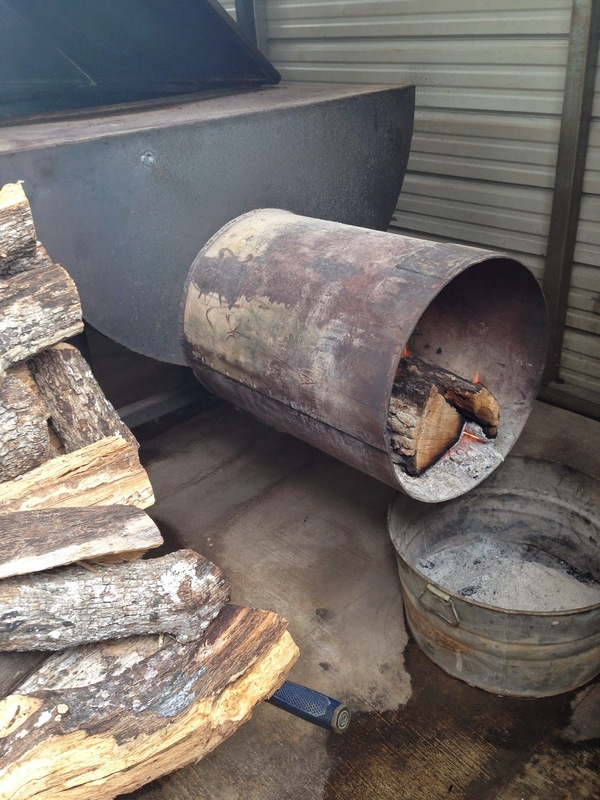 Know what a Pecan Lodge Trough is? It's a beef rib, a pound of brisket, a pound of pork ribs, half a pound of pulled pork, & 3 sausages! 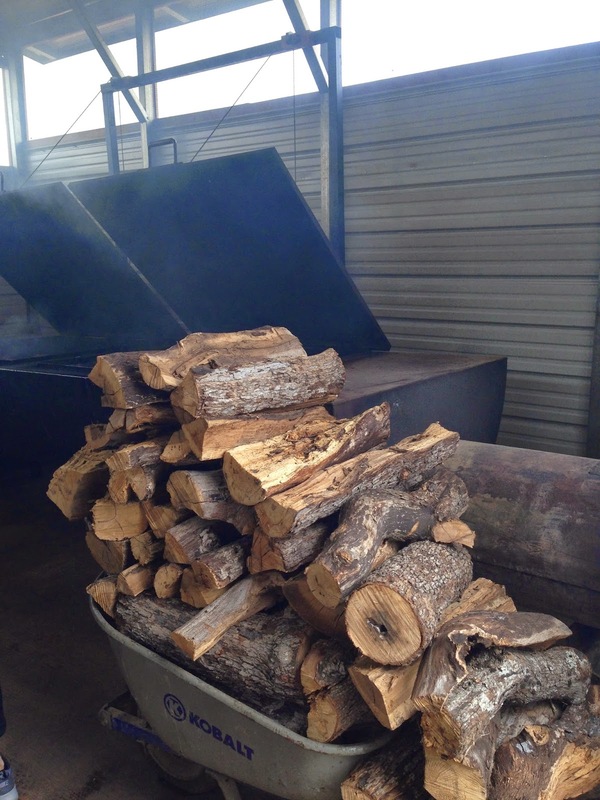 And you get to redeem it in Pecan Lodge's express line, without waiting! You can enter your prediction via comment below this post, via email, or you can tweet it to @ManUpTexasBBQ or submit via Facebook. 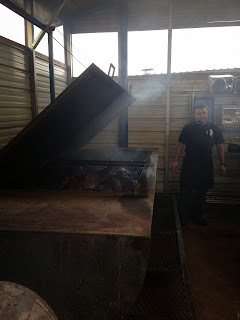 Some pics from the pit tour my Aussie clients took after our meal at Hays County Bar-B-Que. More pics to come. Friday night, I paid my first visit to the original Rudy's in Leon Springs. After walking around and taking some pictures, we got a to-go order from the takeaway section in the back. Pics of the food to come, but here are the pics from the restaurant.